Ethan Frome by Edith Wharton is the best book I have read all year. Edith Wharton’s style and choice of words and plot were so good that when I finished reading, I turned back to the first page and read the book again. I’ve never done that before. The story is told by an un-named narrator who is working near Starkfield, Massachusetts, an imaginary village in the mountains where the winters are extraordinarily harsh. 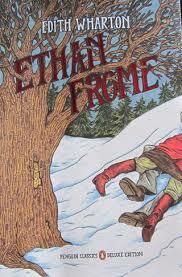 Ethan Frome, his wife Zeena and Zeena’s cousin Mattie Silver live together in extreme poverty on the Frome farm. Ethan is a taciturn man, who has been lame since a “smash-up” in his youth. Ethan appears to the narrator to be much older than his 52 years. The narrator hires Ethan to drive him to and from work in his sleigh, and after a week of travelling together through the snow, a bout of particularly bad weather forces Ethan to offer shelter to the narrator overnight at the Frome farmhouse. The narrator imagines the story of how Ethan, Zeena and Mattie came to be living in poverty and unhappiness based on the gossip he has heard from the Starkfield townspeople and on his own experience after staying in Ethan’s home. The narrator’s vision of how Ethan’s life came to this makes up the remainder of the story. Ethan was quite young when he married Zeena, who is seven years older than him. Zeena came to Starkfield to nurse Ethan’s mother. Later, it comes out that Ethan would not have suggested Zeena stay with him if his mother had died in the spring, but the thought of a lonely, harsh winter was too much for him and he latched on to Zeena. Within a year of their marriage Zeena became a miserable hypochondriac, who held Ethan back from selling his unprofitable farm and sawmill, unable to leave Starkfield to try and make something of himself in a town with better opportunities. Mattie Silver, who is Zeena’s poor relation, came to live with Ethan and Zeena in order to assist Zeena with household chores. Mattie is young and light and bright and of course Ethan fell in love with her. Zeena appeared oblivious to Ethan’s feelings for Mattie, and uninterested in everything apart from her own health, to the point of leaving Ethan and Mattie alone overnight when she goes to town to visit a doctor. Ethan’s pleasure in being welcomed home after his day’s work by Mattie, eating together and later sitting by the stove talking in Zeena’s absence is the high point of Ethan’s life. The message in this part of the book for me is to be careful of what you wish for. When Zeena returns the following night, she tells Ethan that Mattie has to go, as she needs a hired girl who will take on more of the household work than Mattie is capable of. Ethan can not afford to keep a hired girl and Mattie. He is unable to stand up to Zeena, particularly when it becomes clear that his wife does know of his feelings for Mattie and he ends up taking Mattie to the train station. Ethan considers leaving Starkfield with Mattie, but he realises that Zeena would be left in terrible poverty. He is also aware that his and Mattie’s future would be financially precarious, and decides to stay with Zeena. Ethan had previously promised to take Mattie coasting, and on their way to the train station, he delays their parting by offering to take her down the hill on a sled which was left behind by someone else. Ethan and Mattie coast down the hill once and then kiss. Suddenly desperate for each other, and with no way to be together, Mattie convinces Ethan to form a suicide pact. Their plan is to coast down the hill again and kill themselves by smashing into the big elm tree at the bottom of the run. Ethan fails miserably, and instead they are both injured terribly. Zeena, who has been portrayed by the narrator’s vision throughout the novel as being unkind and unloving, ends up looking after a paralysed Mattie, and Ethan, who was lamed in the smash up. Ethan, Zeena and Mattie live together in extreme poverty and misery for the next 24 years, with Ethan sandwiched between a wife he doesn’t love and Mattie, who has become a querulous, whining, invalid. Funnily enough, Zeena is a good nurse and actually seems to recover her own health as a result of being needed, but this and the happy night Ethan and Mattie spent together in Zeena’s absence are the only successes the characters enjoy in the novel. The misery of their poverty and the harshness of Starkfield is overwhelmingly sad. It has been a few weeks now since I read this novel, but I can’t let go of the characters. I keep thinking of Zeena, and wondering why she was the way she was. The story is told from Ethan’s imagined point of view, but poor Zeena was a victim too, trapped in a loveless marriage and watching her husband fall in love with a younger, prettier woman. Even Mattie’s story may be different from the narrator’s vision. I can’t understand why Mattie didn’t flirt with and try to secure Denis Eady’s affections, another character who appeared to be romantically interested in her, and more importantly, was well off and eligible. Despite the narrator suggesting that Mattie had been in love with Ethan for eight or nine months, Ethan was another woman’s husband. I would love to read a tribute style novel (fan fiction, I think they are called) based on Ethan Frome, perhaps from Zeena or even Mattie’s point of view. Even Ethan’s own point of view may be different to this story, which meets up with the facts the narrator learns, but may otherwise be imagined. I haven’t read anything else by Edith Wharton, but don’t expect that to be the case for much longer.